Liberia is unique amongst nations in West Africa, in that it was not part of the European scramble for Africa. Liberia was founded with the help of the American Colonization Society, who paid for freed slaves from America to be repatriated back to Africa. As the number of freed slaves grew, they began to form an elite sect in the society. Also, any slaves freed from slave ships where sent there, rather than back to their country of origin. Indeed, after 1833, with the passing of the Anti Slavery Act in Britain, the Royal Navy began anti-slavery patrols which began to send even more people to Liberia. 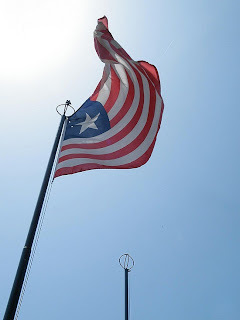 In 1847, the Republic of Liberia was founded, and in homage to the American Colonization Society, the government was modelled on that in the United States. The flag they introduced also copied the flag of the United States. 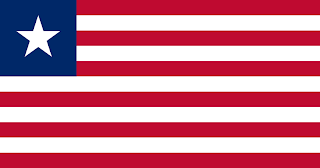 However, the Liberian flag had 11 red and white stripes, standing for the 11 signatories of the Liberian Declaration of Independence, as well as standing for courage and moral excellence. In the upper hoist canton, a single white star in a blue field. The blue stands for Africa, and the white star stands for the freedom the ex-slaves had been given. Welcome to a blog that I have wanted to do for a while. My name is Paul, and I am something of an amateur vexillologist. In other words, I like flags. I find them endlessly fascinating. It is just, effectively a sheet of coloured cloth. However, it is imbued with such symbolism and meaning that people are willing to go to war over this simple piece of cloth! I find the designs to be interesting, and the meanings behind the colours used to be both confusing and inspiring in equal measure! What I have tried to do is to pull together as many flags from around the world as I can, and try to detail a little about them. The history, and the meaning attached to them!